Visitors from around the world come to Hanging Rock, made famous in the film, Picnic at Hanging Rock. No visit to the Macedon Ranges is complete without visiting the hauntingly beautiful Hanging Rock. Hanging Rock (real name Mount Diogenes) is a rare volcanic formation over 6 million years old located near the townships of Woodend and Mount Macedon in Victoria, Australia. 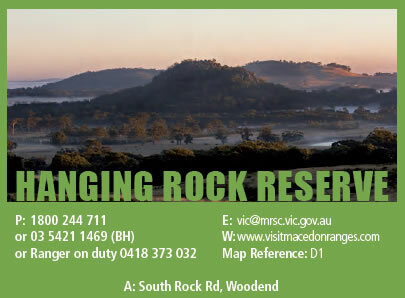 Hanging Rock Reserve caters for a wide range of activities from the racecourse, ovals and tennis courts to wide expanses of lawns. 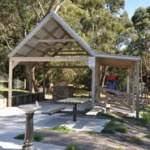 There are coin operated barbeques and picnic areas provided for visitors’ use throughout the Reserve. Cook on one of the barbeques or spread your picnic lunch on one of the many tables provided, then enjoy your meal while you watch the activities going on around you; or take in the magnificent views of the Rock. Made famous in Joan Lindsay’s novel, Picnic at Hanging Rock, and Peter Weir’s film of the same title, ‘The Rock’ is home to numerous events throughout the year and is an icon for visitors and locals alike. Visitors can discover the history, mystery and geology of the Rock and surrounding areas at the new Hanging Rock Discovery Centre. Discover how and when the Rocks were formed; learn about the Reserve’s native flora and fauna, and some of it’s history through a sequence of hands-on interpretive displays. There are numerous walking paths and trails which allow you to explore the Rock and the Reserve at your own pace. If you follow the walking paths which ascend the Rock, you will pass by many of the interesting rock formations, including Stonehenge, McDonald’s Lookout and The Eagle. 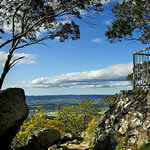 If you follow the path to the top of the Rock you will be rewarded with a magnificent panorama which extends across the district from Mt Macedon in the south to the Cobaw Ranges in the north. 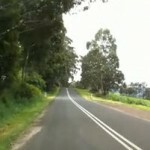 Hanging Rock is easily accessed from the A79 Calder Freeway which passes by on the eastern side of Woodend. 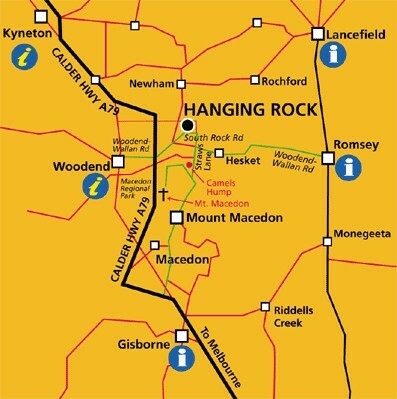 You can also access the Rock via Mt Macedon or from the M31 Hume Highway by turning off at Kilmore and travelling through Lancefield, or alternatively from Wallan via Romsey. Coaches and large groups are welcome but please book with Ranger prior to arrival. Reasonable entry fees are applicable as the Reserve receives no state or local government operational funding. 100% of all income received at the Reserve is used for its continued maintenance, development and care.